This is a shout out to all you MAC fans in the UK! MAC Cosmetics is currently offering free standard delivery on all orders through their UK website. Isn’t it irresistible? So get shopping, girls! As you can see, the offer won’t last for long. I can’t confirm this, but I’ve read somewhere that this free delivery stravaganza is in celebration of London Fashion Week, which is happening this week, and the offer may only last until Wednesday, 21st of September 2011. You will only see that you’re not being charged for delivery when you click on ‘checkout’ or add something to your shopping bag. 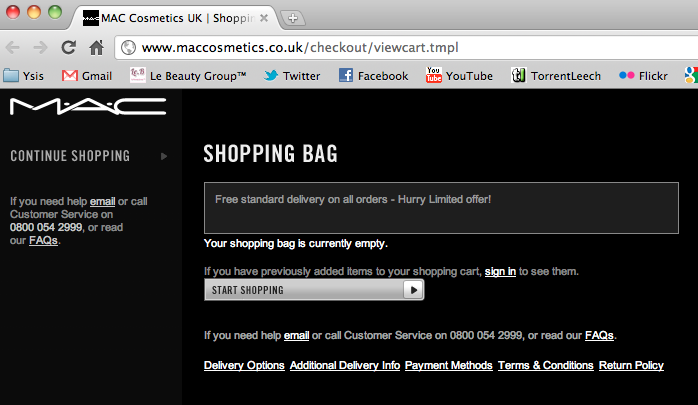 So what MAC products will you be adding to your shopping bag? Let me know on the comment box below!